This reading was done after a surgery, to see how to rebalance and move forward. A first scan of the spread shows good news! 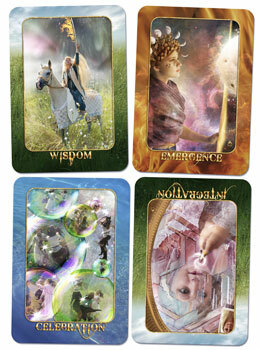 The card elements are fairly balanced: one Fire card (EMERGENCE), one Water card (CELEBRATION) and two Air cards (WISDOM & INTEGRATION) appear in the spread. One Air card (INTEGRATION)is reversed. There are no Earth cards. Let’s read the cards first, then see if the missing Earth element is important, given that this is a medical question related to the Earth element (physical body). An intuitive first impression is that this spread is very positive. The medical procedure was a success that brings a new stage of awareness for the seeker. Also, past experience is helpful in moving forward. Let’s look at each card and see what it says about post-surgical recovery. The WISDOM card means that the seeker can stand in his own truth. He has been through other surgeries in past and knows well what he needs to get through the initial and long-term recovery. The horse symbolizes forward movement and support through nurses, physical therapists and other helpers. The flaming sword of truth in the Queen’s hand in the picture indicates that the heavens support his recovery. The EMERGENCE card is another great omen. The seeker has been trying to get off painkillers, get back into physical fitness such as yoga and sports, and make a major health change. This card indicates he will be successful. The artwork shows veils parting to reveal secret workings of the universe. This person will need to meditate and find quiet time to listen and let new mysteries be revealed. His recovery is the start of a new stage of health. The INTEGRATION card shows the area of challenge because it is upside-down (reversed). Though everything suggests good news, the seeker may need extra time and focus to integrate all the new changes in his life. It is easy to slip back into old patterns & habits. He will need to stay vigilant to make sure the other energies of Emergence, Wisdom, and Celebration can persist as he adjusts to renewed health. Finally, the CELEBRATION card is a third wonderful sign in this reading. Friends and family support the seeker’s health, recovery, and the success of the surgery. The seeker himself can feel relief and companionship, indicated by the rising bubbles and dancing figures in the artwork. Now, let’s return to the missing Earth element. It doesn’t appear to be a major problem, since there is so much positive energy in this spread. However, because the INTEGRATION card is in a challenge position, the seeker may want to pay a little extra attention to eating, medications, and exercise during his recovery. A daily routine that includes mediation and rest will help prevent laziness that can threaten newly formed, healthier habits.